Ready for School | Junior League of Tucson, Inc.
Naveah is now feeling excited about entering 3rd grade after a boost of confidence from spending the morning with Junior League of Tucson members. 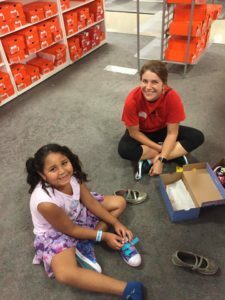 Taking our new brand new Issue Area of Childhood Educational Readiness literally, members kicked-off the League year in late July by helping disadvantaged children entering Kindergarten – 12th grade shop for new clothes and shoes for back-to-school. Students were part of a program hosted by The Salvation Army and they took home backpacks with school supplies along with a little more confidence as they approach the new school year.